I’m excited to introduce our guest writer, Olga Mecking, who writes about her experience practicing yoga with her children. 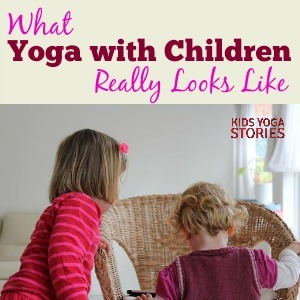 She shares what it really looks like when you practice yoga at home with your children. 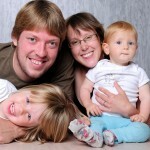 Olga is a Polish woman living in the Netherlands with her German husband and three trilingual children. Inspired by Giselle’s Kids Yoga Stories yoga books and kids yoga blog, I have started doing yoga with my children. I remembered doing yoga as a teenager and young adult, and it did wonders for my self-esteem. I thought doing yoga would be a great way to connect with the children and get into shape at the same time. I found many great apps on my iPad on how to do this, and we got started. Except it didn’t work out the way I thought. Imagine you’re on your hands and feet, with your bottom in the air, in the Downward-Facing Dog Pose. You’re getting uncomfortable and would like to get down on the ground again, except your toddler decides this is just the right moment to crawl under you and you can’t go back on the ground without crashing her. You’re trying to explain breathing techniques except they’re too set on fighting over toys. You haven’t finished the yoga pose you’re doing because your children start doing jigsaw puzzles. You finally manage to get them to do a yoga pose, and then the baby starts to cry. Sometimes I wonder why I ever thought this would be a good idea. But then I remember. That’s because they are children. My daughter swinging around during our yoga time. My oldest is not even four, and yet here I am, requiring deep concentration on a task. 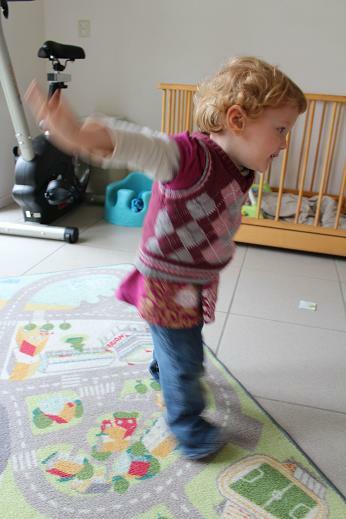 My two-year-old has just learned to walk, and I want her to exercise with us even though she’s still slightly off balance. And the baby, well, he’s a baby, and babies cry. I decide to let go of my expectations. And this is where we start having fun. We even make up our own yoga poses and sequences: the head-bump pose (stand opposite of each other and try to bend down and bump your heads in the process), followed by rolling on the floor laughing. We lie on the floor, all three of us together (and sometimes there is a baby lying on my belly), and we hold hands, and laugh some more. I stop caring whether the yoga pose is perfect, and whether it lasts as long as it should. Instead, I focus on the fun stuff. Like roaring like a lion, and making “ssss”-sounds like a snake, and stretching our necks like a giraffe. Now this is something they can actually relate to, and they want to join me! My daughter practicing the Butterfly Pose. We’re finally having fun and connecting. On top of that, my three-year- old starts doing more and more of the exercises. It’s like learning a song. You learn it bits by bits, not all at once. Even my two-year-old joins in. I do some exercises with the baby as well if I can. We may not be perfectly calm yogis. We are crazy, and loud, and chaotic, but I wouldn’t change it for the world. I am a funnier, calmer mom, and they had fun with the iPad and pretending to be animals. What does yoga with children look like for you? Do you use an iPad to share educational tools or children’s books with your children? Olga Mecking is a trainer in intercultural communication and translator and she also blogs at The European Mama to share her experiences and stories about expat life, multilingualism and parenting. For more of Olga’s thoughts on expat life, multilingualism, and parenting, find her on Facebook, Twitter, Pinterest, and Google+. 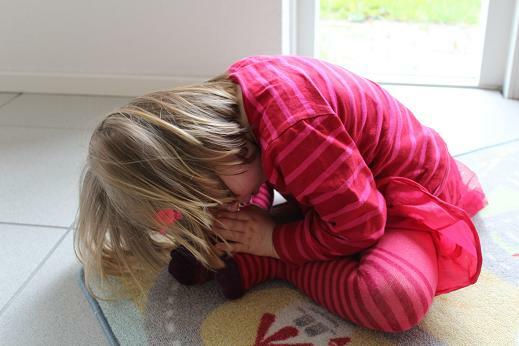 Thank you, Olga for sharing what yoga with children really looks like when you practice at home together! 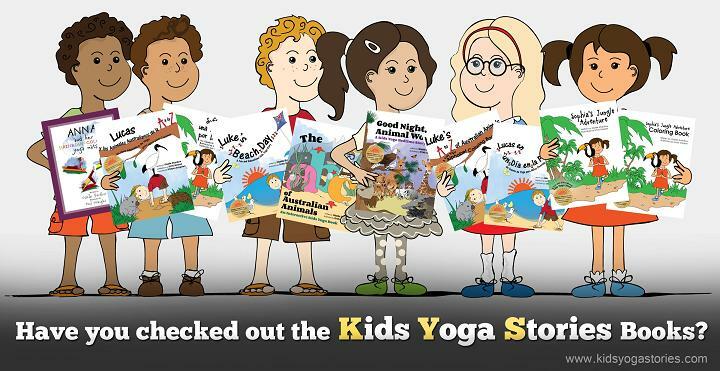 For yoga tips, kids yoga resources, and yoga book updates, sign up for our weekly Kids Yoga Stories newsletter by adding your email address to the box at the top of the page.